“Somebody needs to go to the grocery store.” Sometimes that’s what I say to to my wife, Cyndy, other times she says that to me. It’s our code and we both know what it means. It means that we have no wine and somebody needs to go get some. Twenty minutes and ten dollars later, voila; we have wine. I wonder if that’s how we sometimes hear today’s gospel. I wonder if that’s how we sometimes expect Jesus to act in our lives. There’s a problem to be fixed. “They have no wine.” We tell Jesus. And, voila, somehow he makes more so the same party can continue on as before. But is that really enough? Is all we want just a refill? Do we just want to fix the problem and go on with the same old life in the same old way? I suspect we all, at some point in our lives, just want some magic. We want Jesus to show up, wave the divine wand, and make it all better. They have no wine, abracadabra, now they do. But that’s not who Jesus is and that’s not what the gospel or Christianity are about. In some way magic spares us from God and from life. It keeps us from encountering the new, the possible, the unforeseen. It entertains but it doesn’t transform or change life. A magical reading of today’s gospel (John 2:1-11) leaves us wondering if it really happened. What’s his next trick? How did he do that? And if we’re really honest with ourselves, we know better. Water does not turn into wine. Have you ever seen that happen? Have you ever done it? No, you haven’t and neither have I. And it’s not because we are not Jesus but because there is no magic, only magical illusions. Today’s gospel asks us to move from magical thinking about our lives to looking for and seeing the miraculous. And the question behind every miracle story is this. What does it mean for us? What possibilities does this story raise for our lives and for the world? I don’t know if Jesus literally and physically turned water into wine. But then I don’t think that’s the point of today’s gospel. I don’t think this gospel is ultimately about turning water into wine. It’s about more than that. It’s about calling forth life where there is none. It’s about transformation. It’s about living a new life. The text itself gives us two hints that suggest this. First, the story happens “on the third day.” What does that make you think of? What happens on the third day? Resurrection, a new life, a new beginning, a rebirth. The second hint is, “There was a wedding.” Again, this is about a new life: two people coming together to create and live a new life, to change and be changed by each other, and to open themselves to unknowable possibilities and an unforeseeable future. All that makes me wonder; maybe running out of wine is not a problem to be fixed, but the beginning of something new. Maybe it’s a calling into a new life or an invitation into more life. Nobody likes to run out of wine, but maybe it’s necessary for our growth and maturity. And that can be difficult, unsettling, and sometimes painful. I am not talking about times when we have to decide whether we will see the glass as half empty or half full. I am talking about those times in life when the glass is dry, the bottle is on its side, the party is over, and we’re dying of thirst. And who here doesn’t know what that’s like? We’ve all been there. We run out of wine. Our life is empty, colorless, tasteless. Nothing is growing or fermenting in us. There’s no vibrancy or bouquet to life. Or maybe we still have wine but it’s turned to vinegar, gone sour, and we can no longer stand to drink what’s in our cup. Either way, the wine has given out. When has the wine run out for you? What parts of your life are dry and empty today? In what ways has life become sour or colorless and tasteless? This isn’t only about us, however. We can see and name other people who “have no wine” and places in which “the wine gave out.” It’s happening in our lives, our institutions, our country, and our world. I’m not talking about cabernet or chardonnay. I am talking about the wine of love, intimacy, and friendship; the wine of meaning, purpose, and direction; the wine of vitality, passion, and enthusiasm; the wine of youth, strength, and health; the wine of belief, trust, and faith; the wine of mercy and forgiveness, the wine of peace, joy, and security; the wine of justice, dignity, and equality; the wine of hospitality, inclusion, and welcome; the wine of truth, certainty, and answers. I’ve said those words to Jesus, haven’t you? Every prayer of petition is telling Jesus about where the wine has run out. And more often than not we tell Jesus exactly what kind of wine we need; a nice cabernet, not too dry, with a hint of berries and chocolate. Mary, however, doesn’t do that. Mary does not set out any expectations. She doesn’t tell Jesus what to do. She offers no suggestions about the wine they need. She just names the reality. She lets the reality of the situation call to and invite Jesus to respond. Mary is simply holding open the door for something to happen, the door to a new possibility, the door to a new life, the door of hope. Isn’t that really what we are doing every time we pray? We’re holding opening the door to our life, another’s life, the life of the world, and hoping Jesus will walk through, hoping he will show up and do something. I can’t make you any promises about what will happen when the wine of your life runs out. I have no definite answers. But I know we have a part to play in the possibility of this miracle. Jesus did not do this by himself. 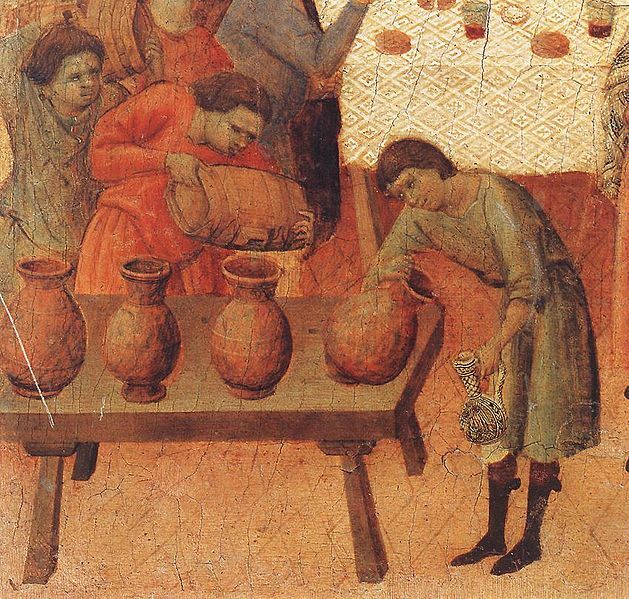 Mary declared the need, the emptiness, “They have no wine.” The servants poured the water. The chief steward tasted, recognized, and named the good wine, the new life. Those are our parts too. We play those parts for ourselves, each other, the world. Sometimes we need to be Mary and name the empty and dry places even when we don’t know how they will be filled up. “Lord, they have no food, no justice, no security.” “Lord, I have no vision or direction for my life.” “Lord, they have no health, no money, no safety.” “Lord, they have no wine.” Sometimes we need to be the ones to carry and pour water even when we can’t see that it’s making a difference. Sometimes we need to be the chief steward naming and recognizing new life, helping others taste the new wine. When the wine runs out Jesus needs us as much as we need him. I want to play my part even if I don’t know how it will all turn out. Don’t you? Isn’t that ultimately what faith and hope are about? Opening the door to Jesus is always a risk. We invite a response not knowing and having no control over what the response will be, or if there will even be one. We’re gambling that God is just as faithful and hopeful as we are, and hopefully more so. We’re wagering that the future to come is worth more, and that the coming life is larger and better, than the empty glasses and bottles that litter our lives. I’ll take that bet and I’ll drink to that. Won’t you? Mike, I don’t know how many sermons I’ve heard preached on this in the course of my life,but I do know that your take on it today really touched me and has given me something to meditate on through out the coming week. I was blessed so often by your words when you were at St. Peter’s Kerrville, and I give thanks that I can continue to be blessed through your blog. Thank you Ellen. I am so glad to hear from you and I remain grateful for you and my time at St. Peter’s. “We’re wagering that the future to come is worth more, and that the coming life is larger and better, than the empty glasses and bottles that litter our lives.” Amen and Cheers! Love, love your take on this. Where do you get your ideas from?!!! Thank you! Thank you Nikki. Right now the writing of John Caputo is very influential in my thinking and preaching. What a great insight into this passage. You are truly a man of God.